Last year, Friends of the Earth Europe (FoE) and GM Freeze found that people in 18 countries across Europe had traces of glyphosate (weedkiller) in their urine. They also commissioned laboratory tests on urine samples and found that on average 44 per cent of samples contained glyphosate. The proportion of positive samples varied between countries, with Malta, Germany, the UK and Poland having the most positive tests. All the volunteers who provided samples live in cities, and none had handled or used glyphosate products in the run-up to the tests. Tom Sanders, head of the nutritional sciences research division at King’s College London, said the levels found are unlikely to be of any significance to health. However, FoE believes that there is sufficient evidence to suggest environmental and health impacts from glyphosate warrant concern. It wants to know how the glyphosate found in human urine samples has entered the body, what the impacts of persistent exposure to low levels of glyphosate might be and what happens to the glyphosate that remains in the body. In Europe, as elsewhere, official approval of glyphosate has been rash, problematic and deeply flawed. A comprehensive review of existing data released in June 2011 by Earth Open Source suggested that industry regulators in Europehad known for years that glyphosate causes birth defects in the embryos of laboratory animals. Questions were subsequently raised about the role of the powerful agro-industry in rigging data pertaining to product safety and its undue influence on regulatory bodies. In the same vein, FoE says there is currently very little testing for glyphosate by public authorities, despite its widespread use, and authorities in Europe do not test for glyphosate in humans and tests on food are infrequent. Glyphosate was approved for EU-wide use in 2002, but FoE argues that the European regulatory agencies did not carry out their own safety testing, relying instead on data provided by the manufacturers. That is, data from studies that were not scientifically peer reviewed. With references to a raft of peer-reviewed studies, FoE draws attention to the often disturbing health and environmental dangers and impacts of glyphosate-based herbicides throughout the world. The FoE study also highlights concerns around the increasing levels of exposure to glyphosate-based weed killers, particularly as the use of glyphosate is predicted to rise further if more genetically modified GM crops are grown worldwide. It is after all good for business. 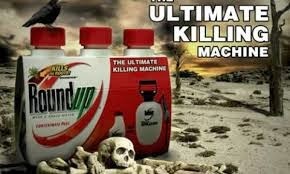 GMOs drive sales of glyphosate. Despite its widespread use, there is currently little monitoring of glyphosate in food, water or the wider environment. There is a serious lack of action by public authorities. Using official US government data, Dr Charles Benbrook, research professor at the Centre for Sustaining Agriculture and Natural Resources at Washington State University, states that in the US since 1996 the glysophate rate of application per crop year has tripled on cotton farms, doubled in the case of soybeans and risen 39 per cent on corn. The average annual increase in the pounds of glyphosate applied to cotton, soybeans, and corn has been 18.2 per cent, 9.8 per cent, and 4.3 per cent, respectively, since herbicide tolerant crops were introduced. Glyphosate is used on many genetically modified crops. Approval of these crops would inevitably lead to a further increase of glysphosate spraying. In the US, biotech crops, including corn, soybeans, canola and sugarbeets, are planted on millions of acres annually. Evidence suggests that Roundup could be linked to a range of health problems and diseases, including Parkinson’s, infertility and cancers, according to a peer-reviewed report from 2013, published in the scientific journal Entropy. The study also concluded that residues of glyphosate have been found in food. These residues enhance the damaging effects of other food-borne chemical residues and toxins in the environment to disrupt normal body functions and induce disease, according to the report, authored by Stephanie Seneff, a research scientist at the Massachusetts Institute of Technology, and Anthony Samsel, a science consultant. The authors conclude that many of the health problems that appear to be associated with a Western (petro-chemical-based) diet could be explained by biological disruptions that have already been attributed to glyphosate. These include digestive issues, obesity, autism, Alzheimer’s disease, depression, Parkinson’s disease, liver diseases, and cancer, among others. While many other environmental toxins obviously also contribute to these diseases and conditions, Seneff and Samsel believe that glyphosate may be the most significant environmental toxin. In 2010, the provincial government of Chaco province in Argentina issued a report on health statistics from the town La Leonesa. The report showed that from 2000 to 2009, following the expansion of genetically-modified soy and rice crops in the region (and the use of glyphosate), the childhood cancer rate tripled in La Leonesa and the rate of birth defects increased nearly fourfold over the entire province. There are major implications for India, not least because biotech companies continue to try to force GM crops onto the commercial market here. On the heels of Professor Seralini’s much maligned (by the biotech sector) findings pointing to the deleterious health impacts of gyphosate, according to a study in 2013 by the Indian Institute of Toxicology Research, glyphosate-based herbicide poses the risk of serious human health hazards including cancer. It all leads us to consider what cost might India pay in the long run. That depends on what price the nation’s policy makers are prepared to put on the public’s health.